The music is about "a disappointing love affair"
The last piece of music ever written by the composer Edward Elgar is to have its world premiere this weekend on the 150th anniversary of his birth. The work, called X-T-C, was discovered by pianist David Owen Norris who will perform it at the Royal Academy of Music in London on 2 June. He said he pieced the music together from two sketches found at the composer's birthplace near Worcester. One of his best works is a highlight of the BBC's Last Night of the Proms. Pomp and Circumstance March No 1 is sung to the words "Land of Hope and Glory". Mr Norris told the BBC that the X-T-C piece is a nostalgic take on his feelings after a love affair. 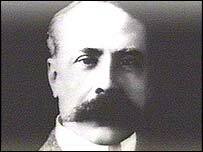 "Like most of Elgar's songs it's about his rather disappointing love affair with Helen Weaver and she fell ill and went to New Zealand to die, but in fact didn't die and haunted him for the rest of his life and many of his songs, like this one, are about how happy he could have been, if only," Mr Norris told BBC News. Elgar was born in 1857 in Lower Broadheath near Malvern, Worcs and died in 1934, the same year that two other great English composers died - Gustav Holst and Frederick Delius. His image was removed from the back of £20 notes earlier this year and replaced by Scottish economist Adam Smith.